Each stairwell is unique, offering different challenges of space, light and style. 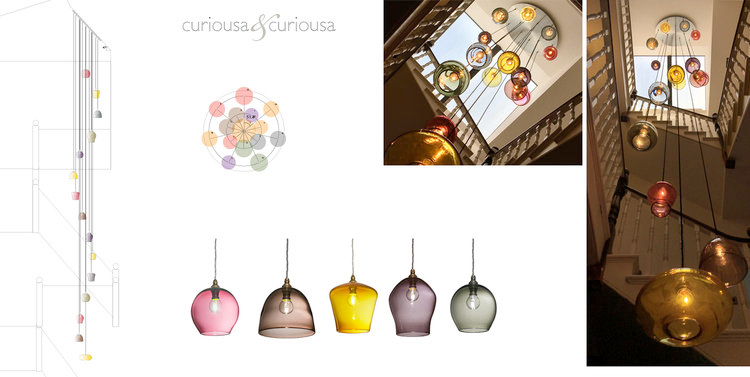 Therefore every stairwell chandelier we design is bespoke, ensuring maximum impact whilst balancing colour and form. By offering site visits and dealing directly with architects, interior designers and structual engineers, we not only ensure your chandelier is visually stunning, but that the technical design and installation is not a burden. Every chandelier is bespoke, designed specifically for your stairwell. From the choice of suspension to the overall height, from glass styles and colours, every option is explored and discussed to create the best possible solution. Working with both 2D and 3D plans we provide a comprehensive, professional service enabling everyone to visualise how the chandelier will work within your space.